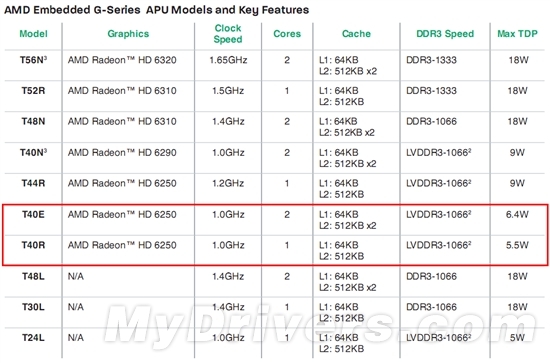 AMD has announced to release two new APU’s (Accelerated Processing Units) which would be part of its G-Series lineup. The remarkable thing about these APU’s is that they consume lesser TDP’s with one APU “T40R” featuring 5.5W TDP and “T40E” having a Max TDP of 6.4W. The T40W would be a dual core model with embedded Radeon 6250HD chipset, 1Ghz CPU Core clock , 512KBx2 L2 Cache while the T40R would also cosnist of the same Radeon chip but would consist of a single core with cores peed of 1Ghz. Both APU’s would support Low Voltage DDR3 rams with frequencies of 1066mhz. AMD also detailed that its G-Series T56N, T40N models would include Dynamic Turbo Core Technology allowing upto 10% boost in GPU Core speeds, The Embedded chips have been updated with HD 6320 for T56N and HD 6290 for T40N. AMD said that the 1Ghz core clock on the newly announced chips would be enough to allows Smooth Windows 7 User Experience with rich DX11, UVD3, OpenCl content.